In our research we typically use molecular simulation techniques to probe simple models that capture the essential physics and chemistry of the system of interest. Applications span a diverse range of fields including DNA nanotechnology, nucleic acid biophysics, cholesteric liquid crystals, colloidal self-assembly, ice nucleation, quasicrystals, polymer and protein crystallization, clusters and complex networks. We collaborate closely with other members of the Oxford Centre for Soft and Biological Matter group. 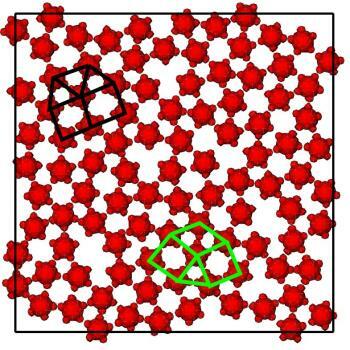 The crystallization of 2D anisotropic particles can provide a model of how anisotropy can be used to aid or frustrate crystallization.